How does psychodrama work in practice? In a typical session, a small group of enthusiastic people work cooperatively to do their personal psychodramas and are led by an experienced practitioner. The trainer will ask someone to get up and act out some of their deepest personal or communal concerns, such as being bullied in the workplace, or the plight of the homeless in society. Others in the group will join in, acting the extra roles in the person’s drama. The session develops spontaneously as each person in turn takes the lead role in their own drama or support roles in other people’s dramas. In this open-ended way, people find ideas and solutions they didn’t know they had, and which they would never have found using conventional training or self-discovery methods. Instead of passively absorbing ‘the answers’, they actively find their own answers and help other people find theirs. The whole thing is spontaneous and fluid, not didactic and rigid. Psychodrama is based on the philosophy and methods conceived of by psychiatrist Dr Jacob Moreno (1889-1974). It grew out of his experiments in Vienna in the 1920’s with the theatre of spontaneity, a form of improvisational theatre. Moving to the USA in 1925 he continued to combine this with his interest in social science, exploring the possibilities of treating clients using group psychotherapy. This work has been further refined by many practitioners and training institutes around the world including in the United Kingdom, Central and Eastern Europe, USA, South America, Japan, Australia and New Zealand. Though somewhat younger, Moreno was a contemporary of Sigmund Freud, and like Freud he developed techniques to get below the surface of ordinary life to help people heal. 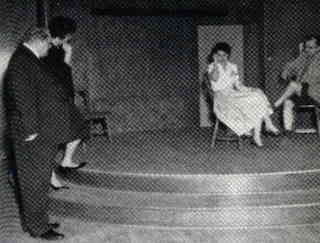 Yet where Freud used the couch, Moreno used the stage, and instead of sitting passively he was an active participant on this stage. Moreno developed several techniques related to psychodrama, including sociodrama, sociometry, role theory and group psychotherapy, all of which are studied within the QTIP program. Psychodrama is being actively used and taught throughout to the world. In places such as North and South America, Canada, the European Union, Russia, Turkey, South Korea, Vietnam, Taiwan, China, Japan. As a participant in a psychodrama session, you can explore the life situations that are of interest and concern to you through this type of dramatic enactment. In the course of the enactment, you can express, refine and integrate new ways of being and doing. Psychodrama works for people of all ages and cultures with a wide range of life experiences. It strengthens your sense of self. It also strengthens your relationships with others and your effectiveness in groups. Psychodrama is taught experientially. This means that the training is highly interactive, involving you with working with yourself, your life, the life of others and then the development of the group. This method of teaching provides a form of deep learning that grounds the learning in your identity not just a series of ideas.